The Paleontology database contains 170,918 specimens and 43,234 images of specimens and cards. Know what you want to search for? Try the Search Specimen Data option. 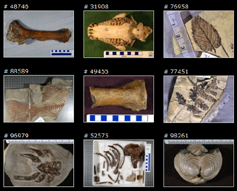 Or, to explore images of Paleontology fossils using basic filters, use the Browse Images option. Search the Paleontology Database by taxonomic classification, geological context, geographic location, specimen numbers, and other text criteria. Use search operators (such as the % wildcard) to search for partial matches or ranges of values. Or draw a polygon around an area of interest on the search map to search a custom geographic area. Results are displayed as lists of specimen label data along with images (if available) and generalized locations on a map. Results can also be downloaded as a text file or PDF document. Images can be viewed at full size in your browser or downloaded as JPEG files. Explore images of fossils in the Paleontology Collection. Don't know what to look for? Simply browse through the image thumbnails to see what appears. 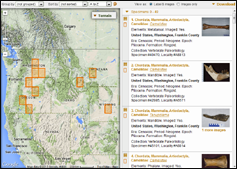 Or, use the filters above the image display to view only fossils for a certain taxonomic group (such as dinosaurs) or from a geographic location, geologic context, or specific collection. Click on a thumbnail image to view the full size image along with specimen record data and the generalized location where the fossil was collected. The Paleontology database contains a portion of the more than 2.75 million specimens of fossil invertebrates, fossil vertebrates, fossil plants, and modern mollusks housed in the Paleontology collections. Specimens are captured in the database as text records containing taxonomic classification and identification, publication information, precise locations (where available), dates and collectors, geological context, notes about the specimen, parts/elements represented, and curation history, among other information. Imaging of selected specimens is underway; these are captured as JPEG images and linked to specimen records for access through the online database. Images are also captured for note cards and locality cards; however locality card images are not publicly accessible online. A custom FileMaker Pro database is used for data entry and storage. The online specimen database is updated nightly from the FileMaker database. Inquiries about the database can be directed to the Collections manager (rceng@uw.edu). *Specimen images only. The database also contains 15,853 locality card images; these often link to multiple specimen records. This site presents data and images of specimens in the paleontological collections of the University of Washington Burke Museum of Natural History and Culture (UWBM). The UWBM makes reasonable efforts to provide accurate and up-to-date information, but cannot make warranties as to its accuracy. Outdated names, erroneous identifications, and erroneous locality information may still be included. Researchers are strongly encouraged to verify all data by direct examination of the specimens and records. We would appreciate notification of any discrepancies or errors (rceng@uw.edu or mrivin@uw.edu). The UWBM and its staff are not responsible for damages, injury or loss due to the use of these data. UWBM data may be used by individual researchers or research groups, but they may not be repackaged, resold, or redistributed in any form without the express written consent of the museum’s executive director. If any of these records are used in an analysis or report, the UWBM must be notified, and the provenance of the original data must be acknowledged. Questions and comments about this site should be sent to rceng@uw.edu or mrivin@uw.edu. Please read the Burke Museum copyright notice before using UWBM data or images in publications.